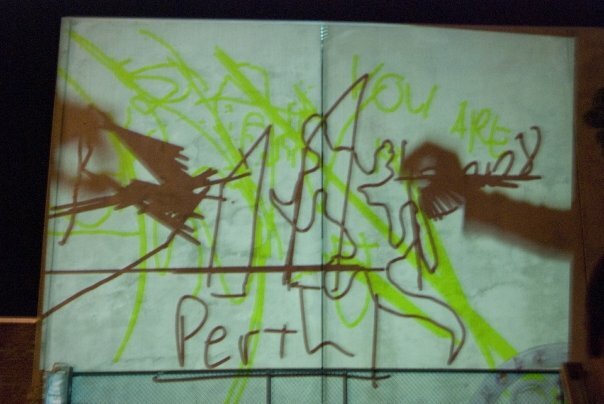 This Past Tuesday the 6th May saw our second night of Free Electronic Street Art in Perth. This time hitting a wall in Northbridge. 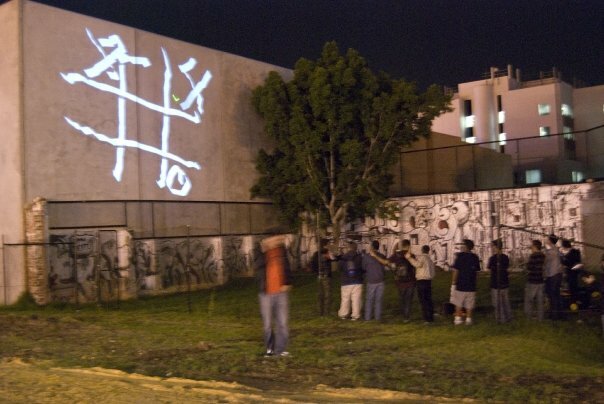 Once again I rocked up with projection gear in tow and with the help of mates we enabled anyone that was willing to get involved in marking public space with light. One of Perth’s veteran Graffiti Artists Shime was there to throw up some quick stuff. Before you go anywhere watch this video! filmed and edited by Stephan its a great slice of the night. The night was a great success, we set up in an abandoned block in the centre of Perth’s Nightlife district. Although our projecting location was little out of the way (hidden behind two sets of fences in an parkland set for redevelopment) the wall was well and truelly visible to the public from the “relatively” lively James street. The spot of course this didn’t stop those in the know from turning up and having a go, not to mention quite a few random people who just wanted to know what was going on. above and below: Laser tag running again in perth. With various hardware configurations running you really had to be there for a while to see all our tricks. The highlight however had to be our successful running of GRL‘s Laser Tag software. 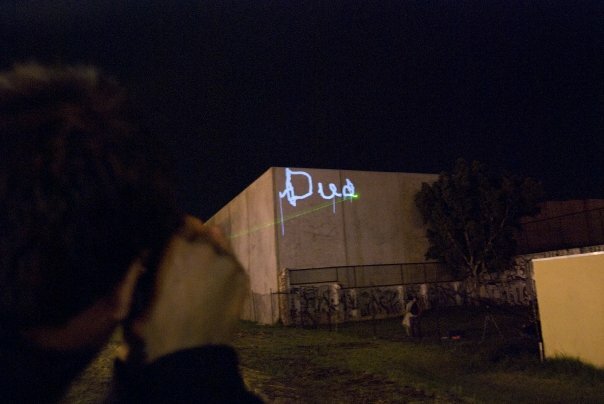 Open source software written by GRL for use by Graf writers and Street artists (no advertisers allowed!). On a similar vane I have been experimenting with Johnny Lee‘s wii remote hacks, using this we are able to draw in front of the projector using a special infrared pen. Over the next month I will be modifying this concept further to make a infrared marker that works at a longer distance. Thanks to all who came to digitally deface this wall! and a specially thanks to those who helped to make this happen… Simon (power), Louise (transportation), Martin (technical), Jason (location scout), Bret (photos seen here! ), Bronwen (packing up), Stephan (video, packing up) and anyone who forwarded my rather last minute invites. 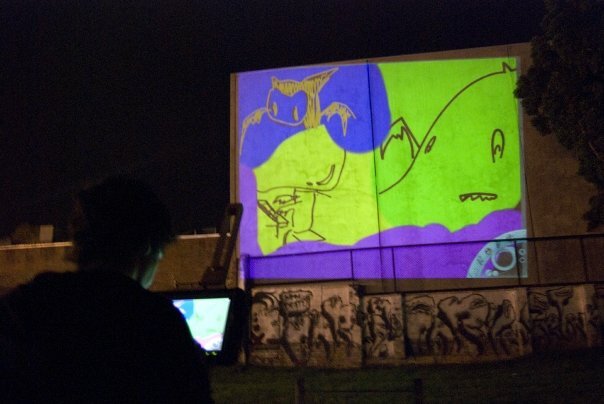 The next planned night will be Wednesday the 4th June (new Moon) @ 8pm, location to be announced, email me to get on the mailing list &/or join this facebook group to keep in the loop – Street Projections Perth. This time we’d like to see more Writers and Street artists get involved if you know anyone… dob them into me… not the police. Cause we wanna see their work on a massive scale.